On June 8, 2004, for the first time since 1882, Venus passed between us and the Sun at inferior conjunction. At the time, a transit of Venus was a sight unseen by anyone alive today. Because of the rarity of the event, a Venus transit has historically been one of the most celebrated phenomena in astronomy. When Venus crosses in front of the Sun, it appears as a black circle 1 arc-minute in diameter. Although the diameter of Venus was only about 1/32 that of the Sun, and it was easy to spot with the naked eye (unlike a transit of Mercury which must be viewed through a telescope). I traveled to Mauritius Island in the Indian Ocean to watch the black outline of the planet travel slowly across the Sun. Mauritius was the site of historic observations of transits of Venus during the 1800's when this event was believed to offer an accurate way to measure the distance between the Earth and the Sun. However, this method of determining the Earth-Sun distance proved to be difficult to apply in practice, due to the "black-drop effect." 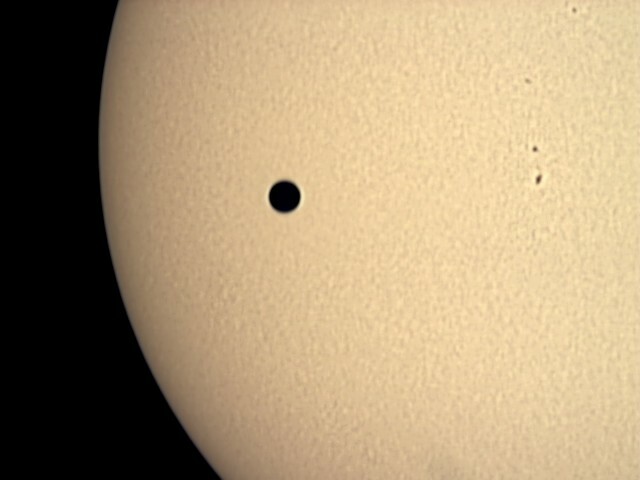 I was able to observe the transit from one of the historical sites where observations were made in 1874. This image was published in the 2006 Vatican Observatory Calendar. This image was also published in the June 18, 2004 issue of the Astronomy Magazine Newsletter. This image was taken with a ToUcam web cam on a Takahashi FS-78 refractor at prime focus with a solar filter over the telescope. I captured this image from Port Louis on the Island of Mauritius in the Indian Ocean.